This Warfighter WWII review was made after playing the game five times (two solo, three co-op). We were sent a copy of this game by the publisher in exchange for an honest review. 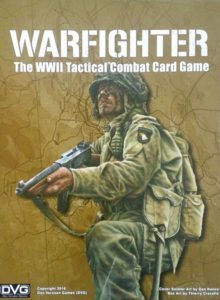 Warfighter: The WWII Tactical Combat Card Game is a solo or cooperative war game in which you have a set amount of time to complete combat missions. In the core game you play as the Americans against the Germans, but the expansion packs allow you to play as different countries. 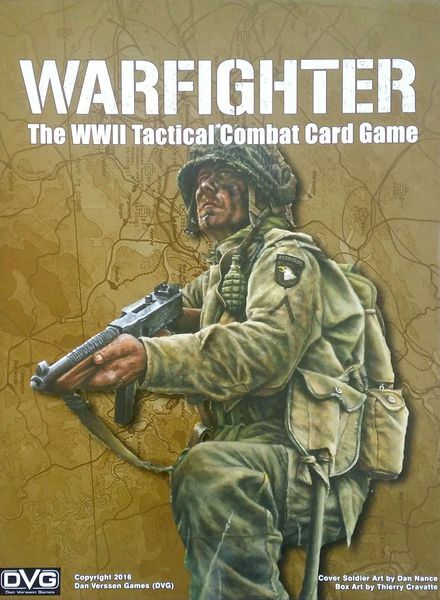 Warfighter WWII was designed by Dan Verssen and is published by DVG. To begin a game of Warfighter WWII, you’ll choose a mission card and an objective card that you want to use for that game. The mission card, which also functions as your starting location, will give you all of the information you’ll need for the mission, including the amount of time you’ll have, how many resource points you’ll have for picking your soldiers and their gear, and where to place the objective card. The objective card is the final location you need to reach and will include keywords that tell you what you need to do to win. Purchasing your soldiers and their gear is a huge part of this game. You have to have at least one Player Soldier in your squad, but other than that you’re free to use your resource points on anything that you want to buy. For example, you could purchase a large squad of soldiers and little else, or you might instead opt to take just two soldiers and use your other resource points to load up on weapons, skills, and equipment. 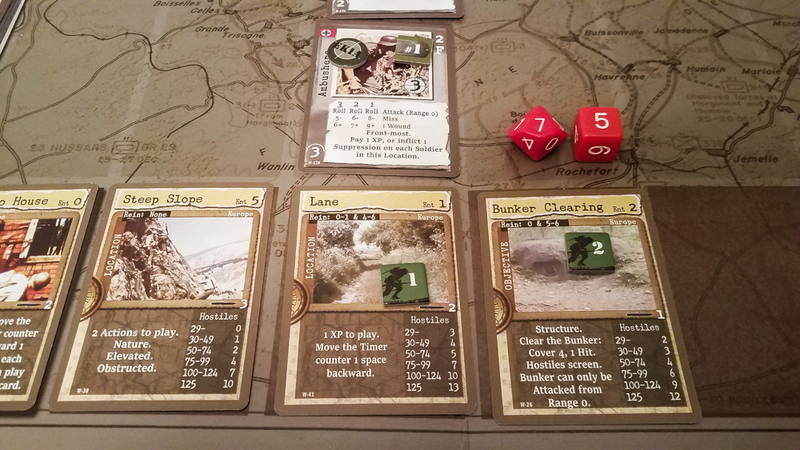 Non-Player Soldiers begin the game with preset weapons, skills, and equipment, while Squad Soldiers just have very basic attacks and no extra cards. You’ll only be purchasing gear for the Player Soldiers you have. 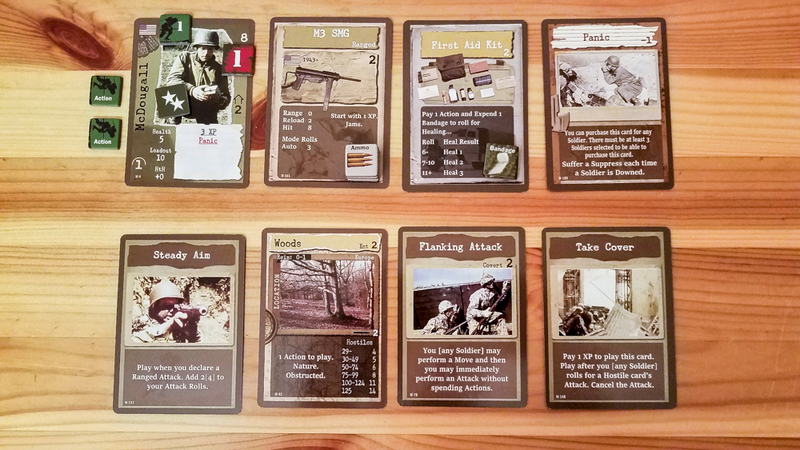 Each Player Soldier also has action cards that they can use. These cards can do a number of things for the soldiers, including making attacks more powerful and helping them target screened enemy soldiers. The action card deck also includes the location cards that you’ll need to move closer to your objective. When moving to new locations, you’ll often have to discard some action cards to “pay” their entrance costs. During the Soldier Turn, your squad will be attempting to fight off the enemies and move toward the objective location. There’s no turn order for your soldiers; you take actions and play action cards with your soldiers in any order until everyone is out of actions. When attacking, you’ll roll 10-sided attack dice and a 6-sided die to attempt to get past the enemy’s cover. Each weapon card will tell you how many attack dice you’ll roll and what you’ll need to roll to get a hit based on your range. If you roll a hit and you roll higher than the enemy’s cover number, you kill one of the soldier’s on that Hostile card. If you hit with your attack but miss with your cover roll, or vice versa, you have suppressed one of the soldier’s on the Hostile card. Each weapon also has a Reload number (usually 2); if you ever roll that number or lower on any of your attack dice, you’ll need to use one of that soldier’s actions to reload their weapon. You gain experience points every time you kill all of the enemies on a Hostile card. Experience points can be used to make some abilities better (Upgunning), such as allowing you to use an action card to help out another soldier or to increase the damage of one of your attacks. When you play a new location card, you’ll place a number of hostiles at that location based on your squad’s current resource value. For example, if your team’s total value is 53, you might have to draw hostiles until their combined experience value is 3 or more. After your squad has taken all of their actions and you’ve used some action cards, the hostiles get to take their turns. Reinforcements will show up in any locations where you have soldiers and will join in the attack. Each hostile is assigned a soldier that they’ll keep following until either the hostile or the soldier is killed. The hostiles can screen each other and can have other special abilities, but they attack pretty much the exact same way as the players’ soldiers. When a hostile suppresses one of your soldiers, you’ll have to spend an action to remove the Suppress token on a future turn before you’re able to take actions with them. Soldiers get wound tokens when they’re hit and they’re killed if they ever have as many or more wounds than they have health points. Once the hostiles are done doing their thing, you’ll advance the timer and start a new Soldier Turn. You’ll win if you’re able to complete the mission’s objective in time. You’ll lose the game if time runs out or if all of your soldiers have been killed. The game is set up and plays the exact same way regardless of the number of players. In a cooperative game, everyone will control their own soldiers and you’ll have to talk about how to approach each location and the groups of hostiles. I definitely didn’t cover everything here. 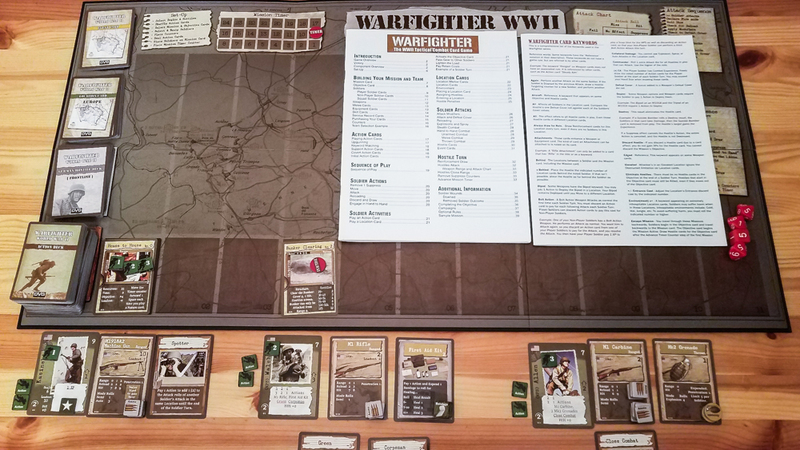 If you want to see all of the rules, check out the Warfighter WWII rulebook at BGG. Picking your soldiers and their gear is almost as fun as playing through the missions. I really like that you can build your team pretty much any way that you want to as long as you don’t go over the resource points limit. There’s a great mix of missions. Some of them will limit what your soldiers can carry with them, while others will reward you for traveling through specific types of locations. You have to factor in the mission and the objective when picking your squad, which makes that process even more interesting. Even without the expansion packs, Warfighter WWII has a ton of replay value. The missions and objectives will create different challenges, your unique squads will make you strategize in different ways, and the random locations and hostiles will make each game feel different. The action cards give you plenty of cool abilities. I especially like the cards that can be retained by spending experience points, like the “Sniper Support” card that can quickly kill off a weaker hostile. The World War II theme is very strong in this game. The soldiers, the weapons, and the images on the location cards all help to bring the theme to life. I’m so glad that they included a full turn sequence list on the board. It makes your first few games much easier to get through and even after that you’ll be happy it’s there to remind you to advance the mission timer. Warfighter WWII works equally well as a solo or co-op game. I don’t think I’d play it with more than three other people, though, since that would probably make the game run a bit too long. The rulebook is formatted oddly and it’s overly long. Every rule is there and I like that there are a lot of rule examples, but trying to locate specific rules can be a bit frustrating. I had to read through the 40+ page rulebook three times before I felt comfortable enough to play. Removing Suppress tokens and reloading weapons are some of the most feel-bad actions ever. Most soldiers only have two actions per turn and there aren’t many cards that allow you to remove Suppress tokens or reload for free. You’ll have a bunch of turns where you have to spend one or more of your limited actions just removing tokens from your soldiers. The first three or four games move along pretty slowly because you have to learn what all of the keywords mean (there’s a four-page keyword reference guide). My most recent games have gone pretty smoothly, but I have a feeling some people will give up on the game before they’ve reached that point. The board looks great, but it’s a bit too wide and the columns above the location cards can’t fit more than three hostile cards. You really can’t tuck some hostile cards underneath other cards to save space since you need to put multiple tokens on each card. If you’re into the World War II theme, I would definitely recommend checking out Warfighter WWII. It takes a little while to learn how to play the game and what all of those keywords mean, but I think most war game fans will get past those things because of the game’s strong theme and high replay value. It’s actually a very satisfying experience, win or lose, despite quite a bit of it coming down to hoping for good dice rolls. What’s great about getting into Warfighter WWII now is that there are a bunch of expansions that you can get for it. They add in new nations you can fight with or against, as well as new actions and gear that can be mixed in with the core set. I am a fan of this game and will continue playing it, but I like DVG’s newest war game, Pavlov’s House, a bit more. It’s an all-around smoother gaming experience, though Warfighter WWII definitely does have more replay value and it can be played by more players. Thanks for taking the time to read our Warfighter WWII review! To stay updated on all things cooperative board games, follow us on Twitter, Facebook, or via RSS.